PLEASE READ THIS WHOLE LISTING TO AVOID DISSAPONMENT! An ever changing inventory of Hardwoods and other hard to find and exotic wood at the Lowest Bargain Prices! Some Listed Hardwoods mentioned here may be sold out, but other new arrivals may be for sale not in this listing. 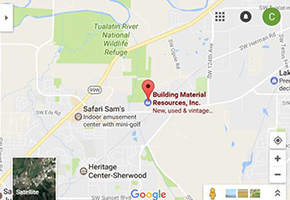 Feel free to call to check inventory, but if you have never been to BMR (Building Material Resources) you have to see the huge warehouse and outside yard to believe it. Also the largest collection of CVG Douglas Fir, Hemlock, Western Red Cedar and Alaska Yellow. Black Walnut, Mahogany, Maple, Calico Walnut, White and Red Oak, Camaru, Batu, Poplar, Knotty Alder and often more not listed here. Remember, We sell out of some species sometimes so call first if it matters to you. Huge selection of Wood Slabs too! Plus glue ups, butcher blocks and glued counter top remnants. Tennessee Red Aromatic Cedar &Spanish Cedar, Beetle Kill Blue stain Pine, Knotty Pine and MORE. The largest selection of T & G you have ever seen in many species of Tongue and Groove. Over 1,400 Doors on the floor for sale, plus a full service door shop to prehang and special order service to solve the most difficult door problems. Even Vinyl windows and patio Sliders at low prices. Our family owned Business thanks those of you who frequent our store, making us successful and grow the last 11 plus years. WE invite you, PLEASE Come and join the repeat customers who say Building Material Resources is their favorite place to shop! Put an end to paying retail so you can come in under budget on all your current and future projects.